The LL.M. in International Law is an intensive one-year course that leads to an advanced legal degree in international law. Stetson Law's program accommodates the specialization needs of both experienced practicing attorneys and recent law school graduates from the U.S. and abroad. The curriculum is designed to prepare graduates to enter the global marketplace thoroughly prepared for positions in business, government, teaching and international law practice or related professions. Founded in 1900 as Florida's first law school, Stetson University College of Law is a leader in international legal education. Stetson is fully accredited by the American Bar Association and is a member of the American Association of Law Schools. Stetson offers a welcoming environment for lawyers around the world, with renowned professors who share the knowledge and skills needed to succeed in the global marketplace. Stetson Law has been ranked as the top law school for Trial Advocacy training for the past 19 years and also as one of the top four institutions for Legal Writing by U.S. News and World Report. 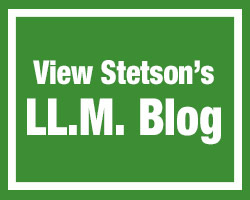 In 2016, Stetson’s LL.M. in International Law program was also recognized by International Jurist magazine as one of the best LL.M. programs for Career Opportunities and for Where Students Feel Most at Home. Due to the small class sizes and our close knit community, we can offer services and give extra attention to our students personal and professional needs. Stetson Law is located 3 miles (5 kilometers) from the beach and minutes away from recreational parks and trails. Downtown Saint Petersburg and Tampa are just a short drive away along with numerous attractions such as Busch Gardens, Disney World, Sea World and Universal Studios. Want to see our campus and surrounding areas? "Stetson's LL.M. in International Law is providing me with a deep understanding of public and private international law, and the American legal system. I enjoy studying in the warm Florida climate with a supportive and friendly faculty and staff."